In their new mortal lives, Alyx & Israel don't remember anything about their supernatural past or each other. When Alyx becomes trapped in a coma deep within a DreamScape maze city, the only one who can help her escape is Israel. They need to find a mysterious Mapmaker and solve his riddle. But is this Mapmaker hiding something? 5.0 out of 5 starsThe perfect ending to a fabulous series. This book is the perfect way to end a fantastic series. Although it is a stand alone novel and would be entertaining in its own right, I have to say that having read the entire series helps to know what is going on in this book and why. With many series there is a feeling of being incomplete, as though there is more to tell. A feeling that you're not quite ready to give up the characters you've come to know and love. Many times there's the question "but what happened after that? ". The Afterlife of Alyx & Israel was the icing on the cake so to speak and enabled me to let go of the story knowing it was complete. I highly recommend this book and the other's in this series. I found I didn't like this last book as much as the rest of the series but it was however still not a bad read and I did finish it. 4.0 out of 5 starsGreat Novel, must read for fantasy lovers. I was given the privilege of being an ARC for this book ahead of its release and I must say it does not disappoint! You really can read it as a stand alone book but I would highly recommend reading the Dark Angel series first as you would be missing out. The finale was worth the wait to find out what happens to Alyx and Israel. The story is easy to follow and gets you hooked early on. The author has a special way of creating an amazing world the characters live in. The characters themselves everyone can relate to, even though they are not all human! This was a fitting end for Alyx and Israel but of course it wouldn't be complete without a few bumps along the way. A great read and a must for any avid reader. 5.0 out of 5 starsAmazing.... I love it! This book is a standalone, however, I prefer to read it in conjunction with the "Dark Angel" series. Alyx and Israel.... what can I say, they are among my all-time favorite characters..... Hanna Peach, you are an amazing author and you have once again outdone yourself! I love the Dark Angel world so I will continue to read everything that is released for it. 5.0 out of 5 starsThe greatest ending ever! When two great loves meet and are able to go on to the great beyond together, what more can they ask out of life. It is the greatest gift given to have lived, loved and died after a long and fruitful life with the one you love, your other half, your soulmate. For these two characters to have had this kind of an ending is the greatest honor that could have been bestowed upon them. The only thug that made it greater was that their friends were there from their new beginning, to their final end. A true love that could end no better than this. Thank you for the great ending. 5.0 out of 5 starsAbsolutely love love loved it! I'm so glad I bought this extending story of the main characters of the 1st 5 books. I want sure what to expect; just that I hoped it would be tried to the characters. The weaving of present & past was nicely done. I was drawn in from the 1st chapter & teared up at the end. I liked that Jordan,Vix, & Balthazar were part of the story. I can't wait for any novellas to come out about Balthazar & Sparrow(hint hint). Thank you Hanna! What words do this book justice? I don't think their are any. It truly was a perfect ending.. Leaving no loose ends (unfortunately for those of us that want more). This book was more about fighting to accept who they were and who they had become than it was about fighting demons. In the end love won.. And it was perfect. Being an avid reader I have read my fair share of books and I have to say this book, well the entire series really, is the first that has really moved me to leave a review. The connection to the characters is sublime. I felt a deep connection that made me laugh, scream, and also broke my heart at times. It was an emotional rollercoaster that kept me begging for more and more. As the title says it is the ultimate culmination for this series. Great job! I couldn't ask for anything more from an ending, though I will miss Alyx and Israel so very much. The story is well paced not rushed and the plot continually builds keeping you flipping page after page. If you've ever wondered if Alyx and Israel would have a boring life as mortals, here's your chance to find out. 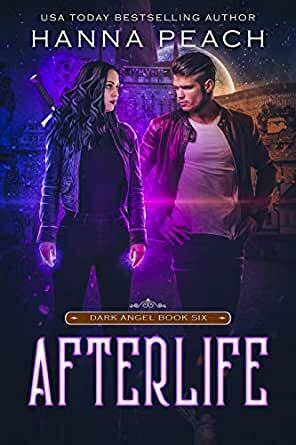 This novel sticks to true Dark Angel fashion by adding in a munch of plot twists, riddles, and magic to show that even mortals can still have a thrilling adventure. It also perfectly concluded Alyx and Israel's story. I ended up falling in love with the characters all over again and I simply cannot wait for the next installment. The only thing missing, which is understandable considering who the focus of the novel was, was how Jordan and Cleo finally ended up getting together. I truly hope that they end up getting their own novel at some point in the future.